A correlation is a statistical measure of the relationship between two variables. The measure is best used in variables that demonstrate a linear relationship between each other. 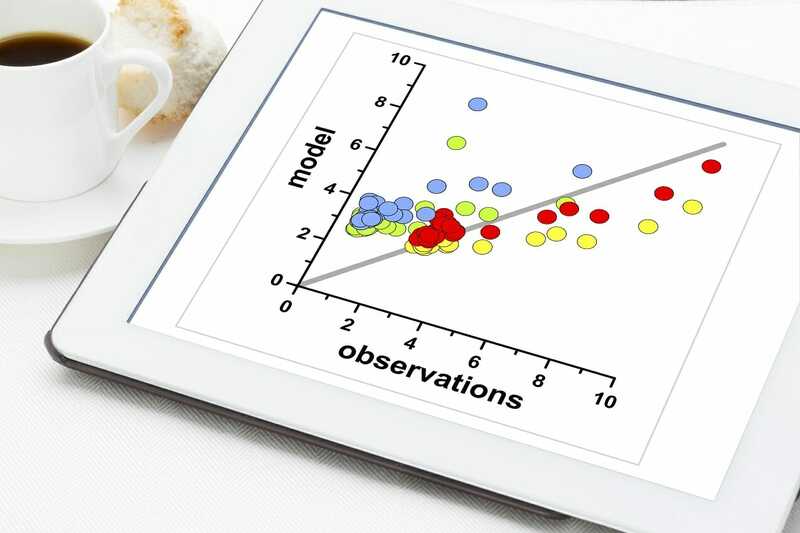 The fit of the data can be visually represented in a scatterplot. Using a scatterplot, we can generally assess the relationship between the variables and determine whether they are correlated or not. -1: Perfect negative correlation. The variables tend to move in opposite directions (i.e., when one variable increases, the other variable decreases). 0: No correlation. The variables do not have a relationship with each other. 1: Perfect positive correlation. The variables tend to move in the same direction (i.e., when one variable increases, the other variable also increases). One of the primary applications of the concept in finance is portfolio managementPortfolio Management Career ProfilePortfolio management is managing investments and assets for clients, which include pension funds, banks, hedge funds, family offices. Salary, skills,. A thorough understanding of this statistical concept is essential to successful portfolio optimization. Correlation must not be confused with causality. The famous expression “correlation does not mean causation” is crucial to the understanding of the two statistical concepts. If two variables are correlated, it does not imply that one variable causes the changes in another variable. Correlation only assesses relationships between variables, and there may be different factors that lead to the relationships. Causation may be a reason for the correlation, but it is not the only possible explanation. How to Find the Correlation? Obtain data sample with the values of x-variable and y-variable. Calculate the means (averages) x̅ for the x-variable and ȳ for the y-variable. For the x-variable, subtract the mean from each value of the x-variable (let’s call this new variable “a”). Do the same for the y-variable (let’s call this variable “b”). Multiply each a-value by the corresponding b-value and find the sum of these multiplications (the final value is the numerator in the formula). Find the square root of the value obtained in the previous step (this is the denominator in the formula). Divide the value obtained in step 4 by the value obtained in step 7. You can see that the manual calculation of the correlation coefficient is an extremely tedious process, especially if the data sample is large. However, there are many software tools that can help you save time when calculating the coefficient. The CORREL function CORREL FunctionThe CORREL function is categorized under Statistical functions. It will calculate the correlation coefficient between two variables. As a financial analyst, the CORREL function is very useful when we want to find the correlation between two variables, i.e., the correlation between ain Excel is one of the easiest ways to quickly calculate the correlation between two variables for a large data set. 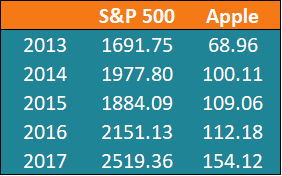 Using the formula above, John can determine the correlation between the prices of the S&P 500 Index and Apple Inc. 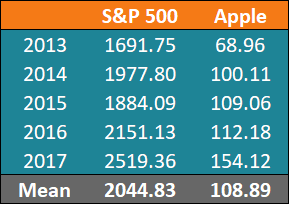 The coefficient indicates that the prices of the S&P 500 and Apple Inc. have a high positive correlated. This means that their respective prices tend to move in the same direction. Therefore, adding Apple to his portfolio would, in fact, increase the level of systematic risk. Thank you for reading CFI’s explanation of Correlation. CFI is the official provider of the Financial Modeling and Valuation Analyst (FMVA)™FMVA™ CertificationThe Financial Modeling & Valueation Analyst (FMVA)™ accreditation is a global standard for financial analysts that covers finance, accounting, financial modeling, valuation, budgeting, forecasting, presentations, and strategy. certification program, designed to transform anyone into a world-class financial analyst. Anchoring BiasAnchoring BiasAnchoring bias occurs when people rely too much on pre-existing information or the first information they find when making decisions. Anchors are an important concept in behavioral finance.